When people look at learning to scuba dive, the normal course of action is to go with the closest or cheapest school at the time. This is something that should not be over looked because as with everything there are good instructors and bad instructors (in many ways) and the different training groups, such as PADI, SSI and BSAC and they all have their unique way of getting you in the water. 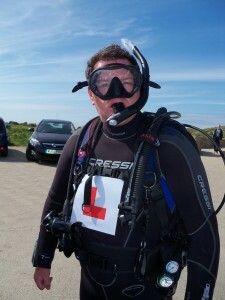 Now I can’t comment on BSAC or SSI because I have not attended those courses, or met any instructors that teach that way into scuba diving but I am going to comment on PADI and the general attitude of Instructors I have met around Cornwall, UK. I will be getting my hands on the books for BSAC and SSI at some point in the near future to compare them myself and will comment about that when I have. What I can talk about is character and quality of teaching, and which ever entry you wish to take into the sport that is something you should be looking out for because as a sport it is extremely dangerous if you have not been given the correct instruction. If you have an instructor that doesn’t feel teaching his/her students is a chore and you are able to bond with them then the experience and the knowledge you will learn will improve your ability when in the water. It is also important to remember that the limited learning with the PADI Open Water qualification does not teach you many of the important things about diving but it gets you in the water quickly, which is where you are going to get the most experience no matter who the instructor is. Now the instructor and school you choose are going to try selling you more, it has to be taken into consideration that they are giving you a service you are paying for that opens your world to something special, how-ever they are there to make money, many of them are self employed and running the school or are only brought into a school when they are needed (for PADI at any rate) and that is why some of them (as they are only human and we all get bored with our jobs at some point) may not be as good as others. It is important to feel comfortable with the person you are learning to scuba dive with, that they are not going to take advantage of you (or more precisely your wallet) and have a manner that what they are saying is clear. This is something they are shown in the PADI system when they become an instructor because of the role play and presentation that they go through, and if they have a good character they will understand why it is being taught that way and will become a really good instructor. As I said these are not questions you should be afraid of asking at this point and the body language should be looked at to see if they are being honest, little things like pauses, glances at each other before they answer, seniority of answering and the like. I hope you can see now why I personally feel that getting them away from the office/school to a neutral place so you can both relax is important, this is your money you are about to spend, and your life you are putting in the hands of someone else to guide you into what is going to be something you will always find an excuse to go do. The great thing about learning to scuba dive with PADI is that it gets you in the water within a few days as a basically qualified diver (to a depth of 18m and with pressurised air) and you can then take that with you anywhere in the world, the only real problem I have with the basic course is the lack of amount of information and skills in an emergency situation, they cover the basics like the Controlled Emergency Swimming Assent (CESA) and the importance of dropping your weights and becoming buoyant at the surface, but there wasn’t really much after that like how to get to the shore with a buddy that is having problems and how to get them out of the water, or even how to bring a diver up from depth when they are in difficulty. This isn’t even covered in the advanced open water and you have to wait till you get to the rescue diver course till you are taught it in detail. I personally feel this is something that should be covered in the basic open water course with PADI because of the importance of having that knowledge as a novice diver. If you have the opportunity the level of rescue diver is something that all divers should aim at with the PADI system till they change it (probably never will though) so you have a greater confidence in the water and with your kit, and others that are with you will respect any decisions you may have to make in an emergency. While you may be trained in this area and others not, do not take complete control ordering people around but listen to others because they may have noticed something you have missed. In Cornwall at the South-West tip of the UK I have met a few instructors and dive masters and was impressed by the ability and knowledge of them all, there was only one I would not go to for a course because he had an inane habit of lying, or embellishing the truth and I wasn’t impressed but to mention the name of the school and instructor at this time would not be fair. There was many a time when I was learning that I asked my instructor questions that were not in the books and the confidence he gave me in answering my questions was brilliant, he did get a little annoyed because there were things I would ask about that for a beginner are not thought important but as I explained before there are things you should know when you are first qualified, mainly so you have more respect for your equipment and your buddy that gets a little overlooked when you are excited at seeing that first fish at 15m and start following it, forgetting about the rest of the group, it is something everyone does at first from what I have personally seen other divers do as they go through the basic open water qualification with PADI.